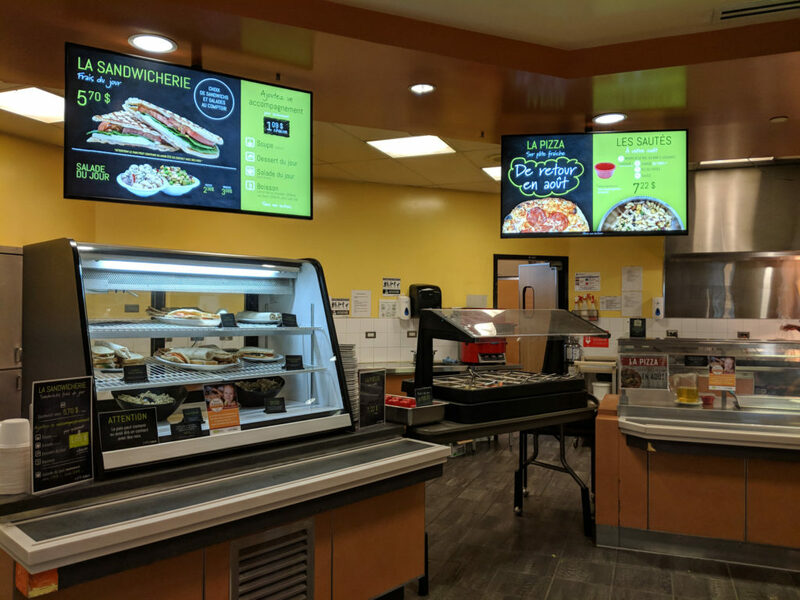 Digital Signage Blog by Mirada Media – Digital Signage News for Mirada Media, Inc.
We recently completed a 7-screen digital menu board installation for the Université de Sherbrooke at their cooperatively-run Café Caus cafeteria. The digital signage network is using Intel ComputeSticks connected to 43″ and 49″ Sharp PN-Y series monitors powered by our MenuView software platform. The cafeteria’s menu offers many choices for breakfast, hot lunches, soups and vegetarian options that change on a daily basis and cycle, week to week, to keep it interesting for the students. The menus are programmed so as to be editable by cafeteria staff and make updates via MenuView’s web-based content management system when the need arises. 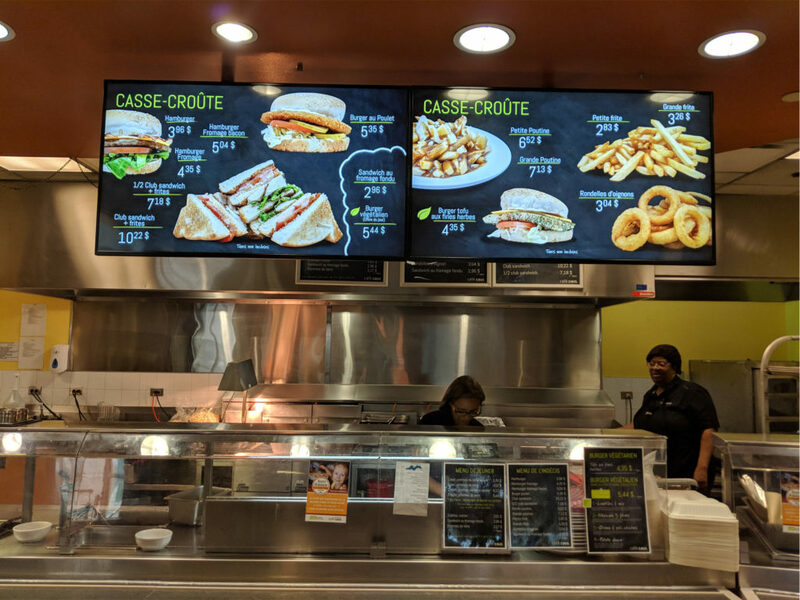 We recently installed a four-screen digital menu board, a vertical greeter board, static window graphics and designed a logo for start-up Chez Alia. Located in downtown Montreal, the quick-serve restaurant serves Lebanese favourites like Shawarma, Shish Taouk and Falafels. We designed the start-up’s logo, menu boards and static graphics affixed to their windows. 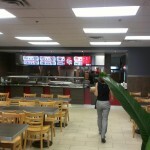 The menu boards are dynamic and are managed with our MenuView software. 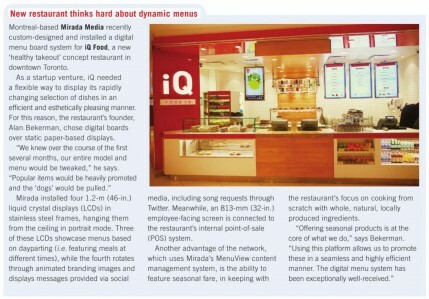 This May’s issue of Sign Media Canada features iQ Food Co.’s digital menu board installation on page 9. Mirada Media’s MenuView software is used to control the menu board visuals and provide day-parting. We also provided the hardware and performed the animation on the great creative done by the people at AmoebaCorp. 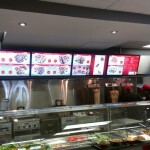 You can find out more about Mirada Media digital menu boards by reading this case study.